Deservedly, Powerhouse just one best online presence for its Collection Database. There is a guy on Twitter called Andrew Barron who is selling his twitter account, with its 1,395 followers, on eBay. Andrew is an interesting guy, in just a few minutes of web searching having found this lovely story on Twitter, I discovered he is the creator of Rocketboom, a daily vlog, a blogger and gets his own wikipedia entry, busy man. The auction ends on 22nd April and already there are over 34 bids and a price of over $1,200. These is a lot of debate on his twitter account about what he is doing and some people seem to feel that he is betraying the twitter community. Hmmm, not sure I agree here. It is certainly getting people thinking about what it all means, which I love and it is also getting him a lot more followers in Twitter (including me). This one day event from Nesta on Tuesday, 20th May 2008, has got a great agenda, some good speaker and it is free. As they say … NESTA’s flagship conference, The Innovation Edge, will bring together a powerful mix of the world’s leading academic, political and industry experts to consider the latest developments in innovation. Speakers are experts from industry, culture, politics and academia such as Bob Geldof, Lord Puttnam, Helen Alexander, Michael Birch, urban artist ‘Inkie’. Be a part of it. Register now here. The Powerhouse Museum is the first museum to join the Commons on Flickr. They are choosing to start slowing with 200 historic images drawn from the Tyrrell Collection of Sydney and its surroundings. A further 50 will then be added each week. In true Powerhouse spirit they have also done something a little different to the Library of Congress – and started to geo-tagging as many of the images as they can. This means you can see the images plotted on a map, then zoom in to browse and navigate. It also means that you get the great mix of ‘then and now’ photography as well. Great stuff. 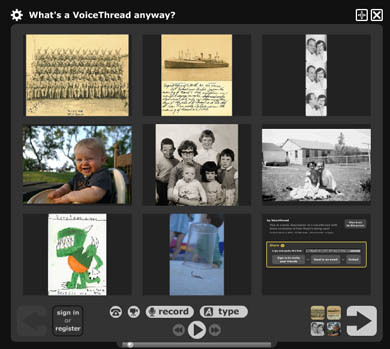 Voicethread is a useful, fun and simple tool for playing around with images, text and audio in ways to add and share meaning(s) with others. :A VoiceThread is an online media album that can hold essentially any type of media (images, documents and videos) and allows people to make comments in 5 different ways – using voice (with a microphone or telephone), text, audio file, or video (with a webcam) – and share them with anyone they wish. A VoiceThread allows group conversations to be collected and shared in one place, from anywhere in the world. At the moment it is free and you can see it would be very useful for any of the educational style, participatory community/local history projects that museums do so well. Also, for teachers, museum educationalists or kids just playing around. Nick Poole (The Collections Trust/MDA) and I are working on plans for a more active and strategic partnership between our two organisations. At our last meeting he showed me a very cool thing from the Indianapolis Museum of Art. 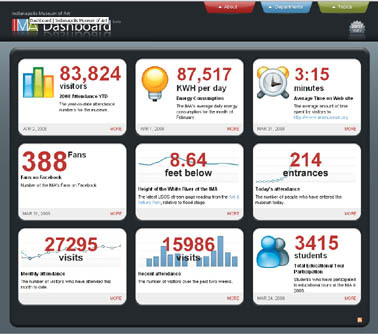 Launched last year it is a live Dashboard of regularly updated data about the museum and its activities – things like visitors through the door, fans on Facebook, energy consumption etc. It basically makes public all the usual statistical information that is normally lost in an institutions annual reports. The visual layout of the data is really nice, simple and easy to see and there is something very compelling about the (almost) live updating. You can also explore any of the top line statistics further making it a fantastic advocacy tool for the museum. You can read more in an interview with Rob Stein the Museum’s Chief Information Officer and Seb Chan. Below is the text and slides from a presentation I was invited to make to the National Museums Directors Conference meeting about what I see as the current digital issues and opportunity that national museums need to know about. 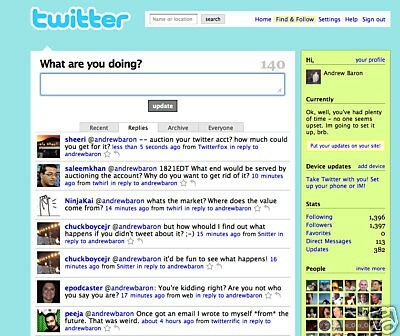 There have been huge changes in recent years online such as the hype about Web 2.0, the blogging boom, delicious, Flickr, etc. Including some high profile projects from museums like the Launchball game from the Science museum whose popularity on the social bookmarking site DIGG took out their server. Too much to talk about in ten minutes, so going to concentrate on three examples of interesting work that is happening at the moment that encompasses some of the key issues. Put online over 70,000 of objects from storage. Built a system that invited and allowed users to tag objects with words that meant something to them. The tags not only add meanings that sat alongside the curators tags but also created better links between data and search engines. Within first three months every single object had been viewed. Since launch in June 2006 over 25 million collection records viewed. 300% increase in overall traffic. They have developed a very nice way of treating the viewing of objects online (above). Result is that they have in effect turned their museum inside out. Opened up access and improved visibility to search engines. Through their interaction with people, have brought knowledge back into the organisation about their collection. At Powerhouse the success is driving organisational change- puts the collection back at the centre of the organisation (why they exist, why they are different to other ‘leisure attractions‘). Most popular three objects have never been on public display, up-turning internal perceptions about collections. Culture24 is working with the lead developer at Powerhouse who is doing this work – Sebastian Chan – because we are working with him on our international project Culturemondo Seb writes an excellent blog called Fresh + New about their work that is well worth following. Through my conversations with him, I know that it is not about big budget, but clever use of technology. Their *particular* system is also giving them new ways of understanding their audiences. Software their team has built to present the collection (recommendations engine, social tagging, smart ranking) is generating an enormous amount of business intelligence around their collection and how people use it. The intelligence allows the Powerhouse to rethink its real world exhibitions, classification and documentation processes, and will lead to more effective communication to their audiences. It isn’t just that the collection is online … it is that it is usable, user-centric, self-learning, and dynamic. Another project, just gone live that also uses tagging of collection but in this case they have put their collections into an existing online community. Show the hidden treasures in the huge Library of Congress collection. Show how with audience input, a tag or two can make the collection even richer. – About 400 people added one tag, all the way up to one person adding 5,000! Also created so far about 10,000 new contacts to the Library’s account in Flickr, so new photos they publish will fall into the “photos from your friends” page, and into RSS feeds and such. This project interconnects the historical and contemporary, creating relationships between the two, effectively making Flickr a huge record of living social history photography. Third and final example if much closer to home. 3. Integrated Architecture project – Partnership with MDA and MLA. This builds on work Culture24 have done championing data sharing across sectors. Things like our RSS feeds and our agreement with Visit Britain to provide them with all our event data for inclusion in their own site. It is also informing our current work with LOCOG to provide them with UK wide event information about Cultural Olympiad for inclusion in all their online projects. As well as our work that has just received support form DCSF and BECTA to get stuff in front of teachers, kids and families. For me, the Integrated Architecture project is about collaboration and an understanding that the future of the online world resides in the ways that information comes together into services and structures that meet the needs of different users in different ways. So could museums in UK do what Powerhouse has done? Yes of course, but why not go further? How about browsing across collections and institutions. Searching across different organisations. Bringing together meanings? I see this as the big opportunity and the recent changes at MLA I think offer a chance to be bold. To work across sectors with ACE, Tourism, Creative Industries and address the fact that there is still a lack of any digital strategy in the UK cultural sector. I think a good starting point is with the National Museums Online Project, which I am sure you all know about – as you have helped to support the consultancy work that is just beginning. As you know it initially brings together a few of the nationals – Science Museum, National Maritime Museum and V&A, with Culture24. Bridget Mackenzie from FLOW has been appointed to explore the possibilities for online collaboration between different nationals and their digital collections. There are very exciting opportunities here to bring on board an even wider set of partners, people like, MLA, PCF, Art Fund, Arts Council and DCSF, and set a national agenda that is focussed on needs of users.